VeggieBlend with Natural Carrot Flavor Premium Daily Bird Food provides healthy and balanced nutrition for Conures, Amazons, Greys, Pionus, Caiques, Senegals and any other medium to large parrots that prefer this nugget size. Nutritionally complete. Should comprise 80% of your birds diet. Available in 3.25 pound bags. 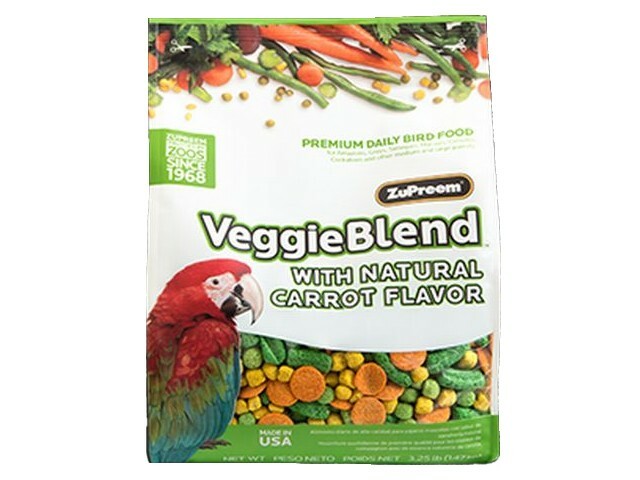 Ingredients: Ground corn, Soybean meal, Ground wheat, Wheat germ meal, Sugar, Vegetable oil (preserved with mixed tocopherols), Celery, Green beans, Carrots, Parsley, Beets, Peas, Calcium carbonate, Dicalcium phosphate, Iodized salt, Natural carrot flavor, DL-Methionine, Choline chloride, Vitamins (Vitamin E supplement, Niacin, Calcium pantothenate, Vitamin A supplement, Biotin, Riboflavin, Pyridoxine hydrochloride, Thiamine mononitrate, Menadione sodium bisulfite complex (source of Vitamin K activity), Vitamin B12 supplement, Vitamin D3 supplement, Folic acid), L-Lysine monohydrochloride, preserved with Citric acid and Mixed tocopherols, Yellow 5, L-ascorbyl-2-polyphosphate (a source of Vitamin C), Yellow 6, Minerals (Manganous oxide, Zinc oxide, Copper sulfate, Sodium selenite, Calcium iodate), Blue 1, Color added, Rosemary extract.